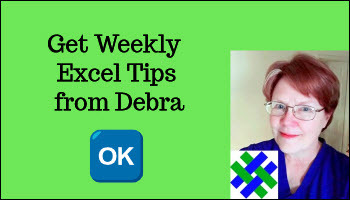 A complete list of Excel functions, and short videos show how to use popular Excel functions. These tutorials show how to use some of the most popular Excel functions. Click to start the Functions video playlist. Or, at the bottom left of the video, click "Playlist", and click on a video thumbnail to start that video. Below is an interactive list of all the Excel functions. Click a heading cell, to sort by that column. Type in the Search box to filter the list. Click the links for more information on a specific function. 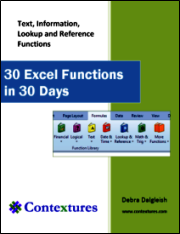 Some functions are included in the 30 Excel Functions in 30 Days (30XL30D) ebook kit, and those are marked with an X in the 30XL30D column. Returns the average (arithmetic mean) of all cells that meet multiple criteria. Returns a key performance indicator (KPI) name, property, and measure, and displays the name and property in the cell. A KPI is a quantifiable measurement, such as monthly gross profit or quarterly employee turnover, used to monitor an organization's performance. Returns a member or tuple in a cube hierarchy. Use to validate that the member or tuple exists in the cube. Returns the value of a member property in the cube. Use to validate that a member name exists within the cube and to return the specified property for this member. Returns the nth, or ranked, member in a set. Use to return one or more elements in a set, such as the top sales performer or top 10 students. Returns an aggregated value from a cube. Converts a number to euros, converts a number from euros to a euro member currency, or converts a number from one euro member currency to another by using the euro as an intermediary (triangulation). Returns data from a web service.